Supplementary attractions might not be the correct choice of words, but as we have done our gardening to provide natural attraction for birds, we can add “less natural” elements to further draw them. I call these less natural as they require actions and additions to your garden which will require your direct involvement on a daily basis or add features which would be built within your garden. These attractions are feeding trays or areas and nesting houses or logs. The most basic feeders that most people start off with are hanging seed feeders. These are readily available to buy and easy to place and fill. On a more advanced level one can build a feeding tray catering for a wider variety of food. The simplest feeding area is to just place the food in a sheltered spot on the ground. This should only be done if you do not have dogs or cats that will catch the birds or eat the food. Be aware that this form of feeding has a big change of attracting rats or mice. The most basic feeding “tray” is to use a wooden pole or old dead tree trunk and hammer some nails in the top where fruit and bread can be pinned on, add some big nails on the sides as perches. The most popular feeding trays are those either placed on top of a pole or hanging from a branch. I recommend that the tray has a raised edge so that food does not fall off, but make sure that there are gaps for drainage. Large nails through the bottom are good to secure fruit and bread, and to prevent larger birds like Grey Go-away Birds from carrying it off. If you are going to feed seeds and bone meal from the tray, I suggest securing small bowls where this can be placed in. I am more in favour of feeding trays on poles as they are more stable. The pole should also preferably be a metal pipe, as rats and mice will be able to climb up a wooden pole. This is also the problem with hanging trays as they have access from the branches. The tray should be close enough to shelter for the birds, but far enough so rats and mice cannot jump on top. The tray should also have an overhang of at least 15 to 20 centimetres, again to discourage rats from getting on. There are a variety of seed feeders available on the market, but you have to evaluate which are the most practical. The first consideration is the ease of filling. Preferably it should have a top that opens so the seed can be poured in. Some feeders require the seed holder to be removed when being filled and flipped back in to place without all the seed pouring out. The feeder must also allow for smaller birds to perch and eat, but not have enough space for doves to perch, as they will take over the feeder. The smaller birds will mess seeds and allow the doves to feed on the ground. Placing seeds on the feeding tray can also lead to a take over by doves, especially Rock Doves, but scattering some seeds on the ground should draw them there, as they prefer to feed on the ground. I have had a few different nectar feeders. The cheap ones are made from a 500ml cold drink bottle with a cup glued on that dispenses the water. These do not last long and they do not seem very comfortable to the birds. 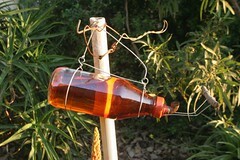 The other is the nectar feeders used for hummingbirds. More and more people are using them for our sugar and sunbirds. The problem with them is that they are built for hovering birds and not for our larger birds that perch while feeding. This can be overcome by adding a wire rail around the feeder. The flower cups also do not last long as they are ripped off by the birds and so give access to bulbuls, weavers and other birds to feed as well. I have as yet not tried one of these feeders, but most people seem very happy with the results. My favourite feeder is the one made from a glass bottle with a feeding tube in the lid and a strong perch. These are easy to fill and hang. All nectar feeders are prone to being taken over by bees and they can empty the feeder in no time. Some say that the solution to is to add red food colouring to the water. In nature most of the flowers that sunbirds visit are red or orange, and apparently bees are unable to see the colour red. I doubt this as my feeder gets taken over from the bees that I have a wild have in my garden. If they still find your feeder, it is best to move it to a different area in the garden. The most common species that you could attract are White-bellied, Amethyst, Scarlet Chested, Greater Double-collared, Southern Double -collared and Malachite Sunbirds. In the Cape you also have a chance at attracting the Cape Sugarbird. One can use almost any of the commercially available seed mixes to attract seed eaters. 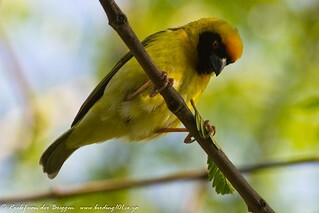 Thick-billed Weavers love sunflower seeds, but do not generally take them from feeding trays. Planting a few sunflowers could do the trick, and they will return till the whole head has been eaten clean. That is if you have them in your neighbourhood of course. I do a mixture of crushed mealies and wild bird seed as this goes quite a long way and keeps all of my visitors happy. Be aware that some of the seeds might germinate in your garden, and some become a pest to control. The most common fruits to give are paw-paw, apple, pear, peaches and grapes. Oranges and bananas cut in half are also good, but the bananas must not be overripe. A common fault that many people make is to put rotten fruit on the feeding table, and then they wonder why they get no visitors. If you would not eat it, why would the birds? Fruit that is slightly old, but still edible will do. The dilemma too many people is how do you justify putting good fruit out to the birds, especially as fruit has become so expensive. One option is to become well acquainted with your local greengrocer, and buying old fruit at cheaper prices. The method that works for me is to buy bulk at my greengrocer. Usually, I pay for a box less than I would pay for a few prepacked fruits at a retail chain. The few fruits that I cannot eat then go to the birds, but I have fewer qualms about it, as I feel I had a good deal to start with. A few fruit types that I have found are not generally liked by birds are Kiwi Fruit, pomegranates (except for barbets) and Mangoes. Of course at the height of winter they become less picky and will eat most fruit. When feeding bread, just as with us, whole-wheat is better, but they will gladly take any crusts. I find these days our dry produce like cereals and flour, once opened, become prone to being infested by small beetles or Indian Moth. In stead of throwing these away I use them with a mixture of bird seed, water and baking powder to bake small loaves, that I freeze and place on the feeder regularly. 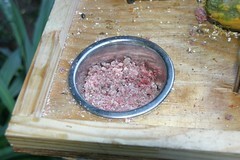 The last and most potent item to place on your feeder is fresh bonemeal. Not the dry powder that you purchase in packets at nurseries, but the genuine bits of meat and bone that you need to ask your local butcher for. Keep the bag of bonemeal in the freezer and regularly put a handful out (preferably daily). 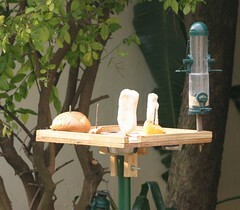 If your birds become used to this you could attract many species that usually will not feed from the table. Possible species that you could lure are Cape, Red-capped or White-throated Robin-chats, wagtails, Fiscal Flycatchers, Common Fiscal, Bokmakierie, Southern Boubou, Black-backed Puffback and Burcells Coucals. When attracting birds to your garden you have to start using less pesticides and where needed move to environmentally save alternatives, but the best is to leave some of the pests for your birds to sort out. Burchells Coucal has a fondness for snails and White-eyes are the best control for aphids. The Wild Peach (Kiggelaria africana), that is such a great fruit tree will be infested with hairy caterpillars for a part of summer. The worms do some damage, but the tree recovers quickly and most Cuckoos find the worms irresistible. Would putting the bone meal into drilled holes of old dead branches attract wood packers. I have used bucket maggot farms on my farm and the maggots in holes on logs the insectivores went nuts. Was wondering if you had tried bone meal. Loved this piece thanks so much. Have an orchard of plum trees outside our house in the drakensberg. Can’t wait to see what comes. Living on a farm we have a big old shed with some barn owls. Rats don’t get near our house. Matt, the Drakensberg is a bit thin on the woodpeckers with only Ground and Olive Woodpeckers around. The Ground Woodpeckers will probably not be that interested as they are much more ground dwelling. If you garden does have Olive Woodpeckers, I would give it a try and see. If not woodpeckers I’m sure that many other birds will be quite interested. I have never placed bone meal in logs, probably because the species in my garden seem quite happy to feed from the bowl on the feeding tray. Hi, I live in Durban South and attract roughly 12 thick billed a day. I put out sunflower in the morning and afternoon, but would like to supplement this as the seed is getting very expensive. Now cones the problem. As soon as I put out fruit, the monkeys eat it. Any suggestions?